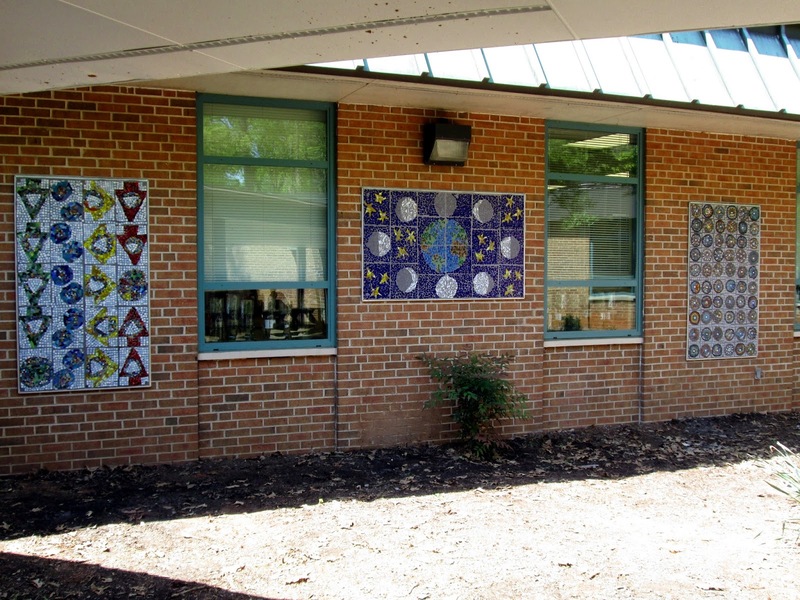 "Ms. Brossart, our mosaics are MAJESTIC!" 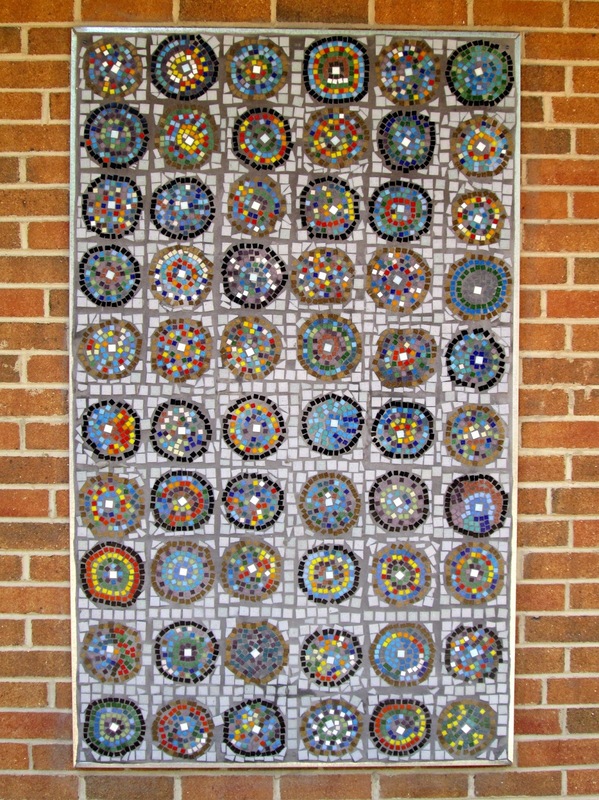 is what I heard today from a 5th grader at Douglas Elementary School as I was finishing up grouting and cleaning them. What a compliment! 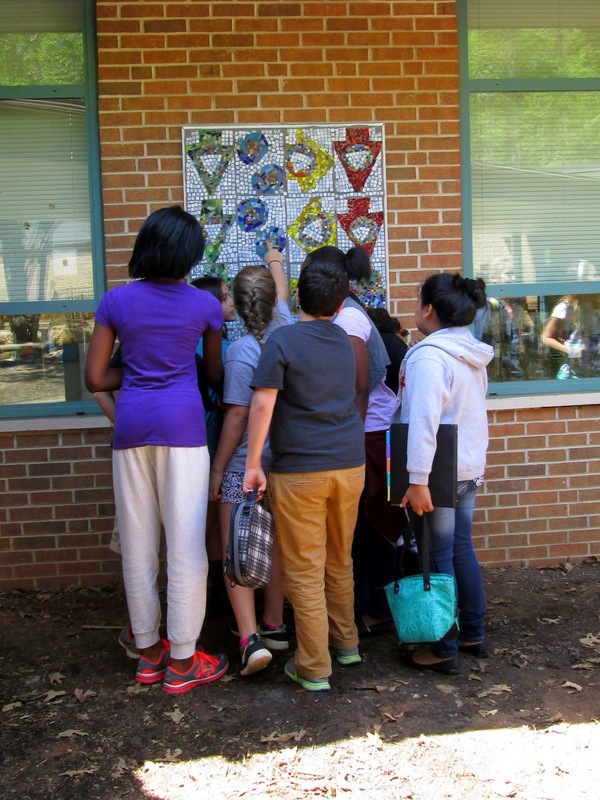 I have been working with these students 3rd, 4th and 5th graders for several months now and finally their mosaic panels are up on the wall in their courtyard. They pass through this area every day to go to the cafeteria. The 5th grade panel science theme is "force and motion". We looked at abstract and geometric art and how simple shapes can tell a story. The first column of green arrows shows gravity, the blue circles depict friction, the yellow arrows show force "push and pull", and the red shows inertia with the forces in balance. The 3rd grade panel science theme is "phases of the moon". All of the stages are shown, new moon, waxing crescent, first quarter, waxing gibbous, full moon, waning gibbous, last quarter, and waning crescent. 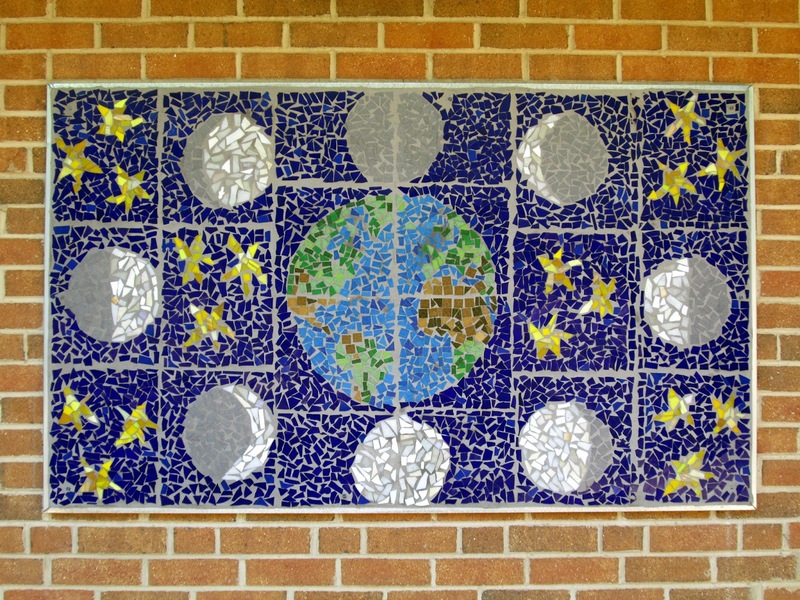 The Earth and stars added for additional sections to mosaic rather than just night sky. You can tell the work has been "portioned" by the grout lines. This is important to me for several reasons. When kids are working collaboratively on a big artwork, they always want to be able to identify "their" work. When the sections are blended, this becomes very difficult for young children to clearly identify and remember what they worked on. Generally, they only concentrate on their own section, so when they see the final work it can be overwhelming. The 4th grade panel science theme is "geodes" to go along with their rocks/minerals curriculum. Besides cool circle art, each geode is designed with specific rocks/minerals in mind. The black/brown outlines stand for igneous/sedimentary rock, each has a white "quartz" center, and the interior colors all match up with a mineral or stone, for example, purple= amethyst. Another reason I like to portion the work is to keep it a manageable classroom activity. 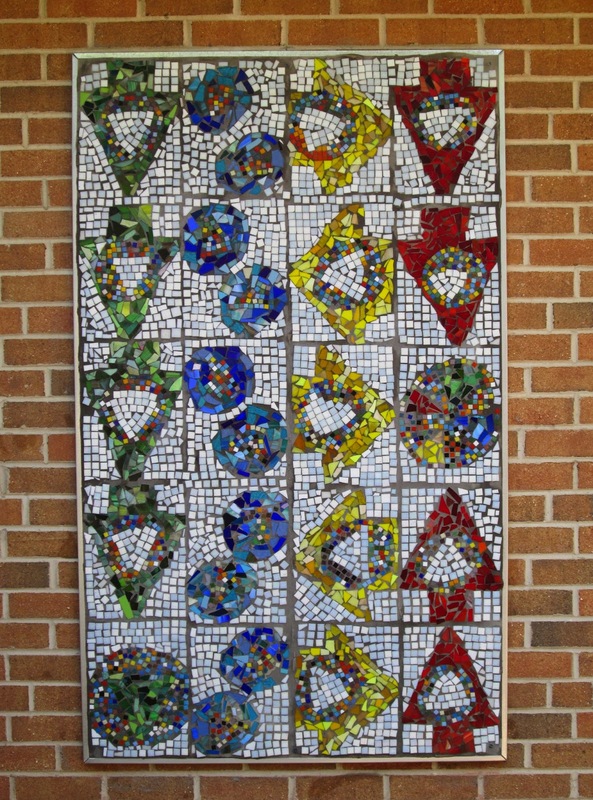 125 students can not crowd around one 3x5' panel, with glass and cement flying to create a work. They work at their own tables on patterns, and then the mosaics all get adhered to the panel at the end of each session. It would take countless hours on my part to additionally "stitch" together the pieces to make a "seamless" work. I prefer to let kids work be kids work. For these kinds of projects, it does not distract me at all. I also just grout over the screws so that the school can figure out where they are if they ever need to relocate the mosaic panel. If the screws are countersunk and a tile placed over before grouting, they would not be able to remove it if necessary. These are really important considerations when working with schools and students. Thanks Douglas Magnet Elementary! It has been my pleasure to work with all of you and your students!